Speedlinking is a term to define a collection (or handful) of good posts on a particular topic, very similar to a Blog Carnival. 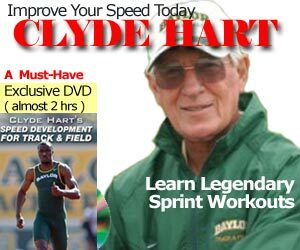 Clyde Hart on the 400: Train slower to race faster from American Track and Field by Andy Friedlander, a nice 3 page scanned article. Strategies and Tactics on Running the 400 Meters By Rob Lasorsa, M-F Athletic Co.